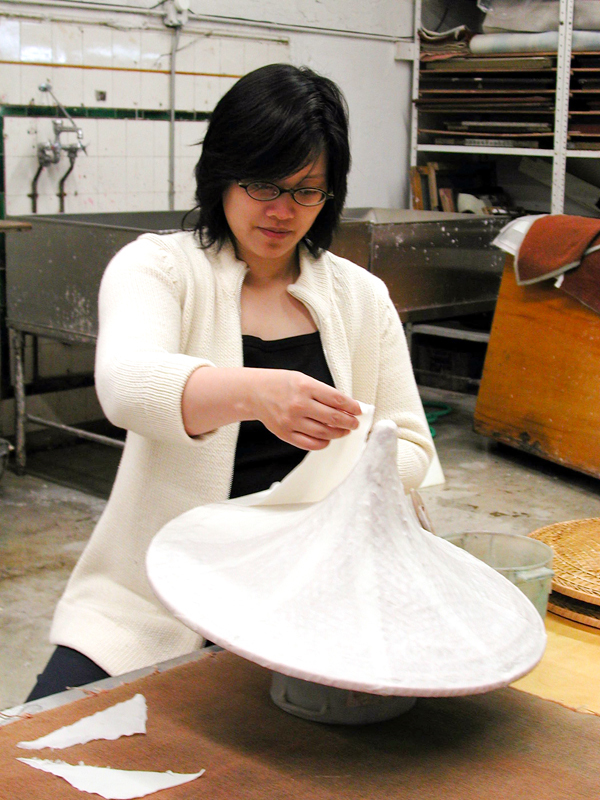 Wennie Huang’s work deals mainly with issues of Asian-American identity (Huang is a second generation Taiwanese-American). 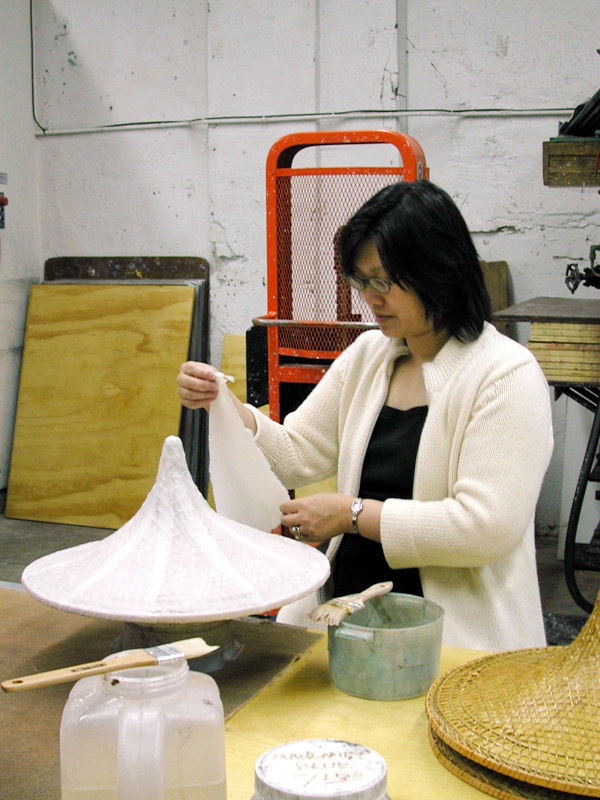 During her residency (2002), she worked on executing a group of cast paper hats using plaster filled Chinese straw hats as the molds. 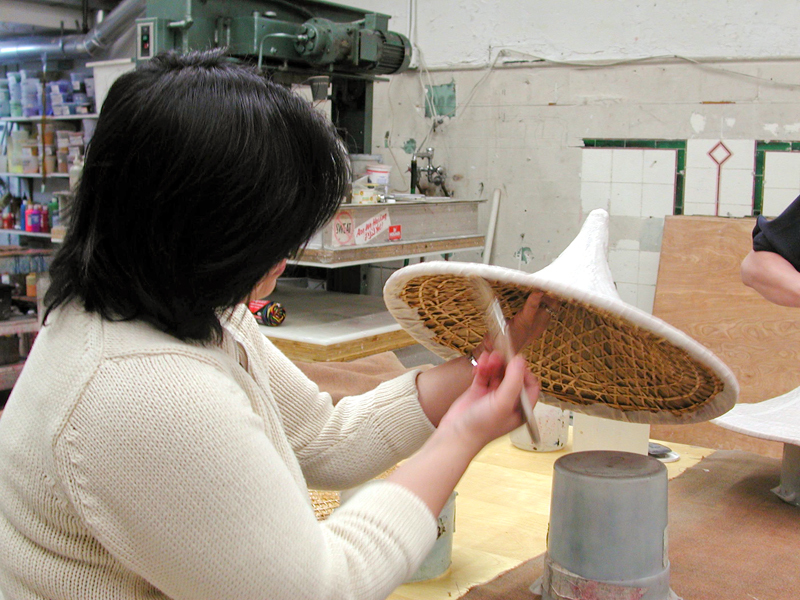 To do this, sheets of abaca paper were formed and pressed in the hydraulic press, laminated to the hats using methyl cellulose as an adhesive between paper layers, and allowed to air dry. 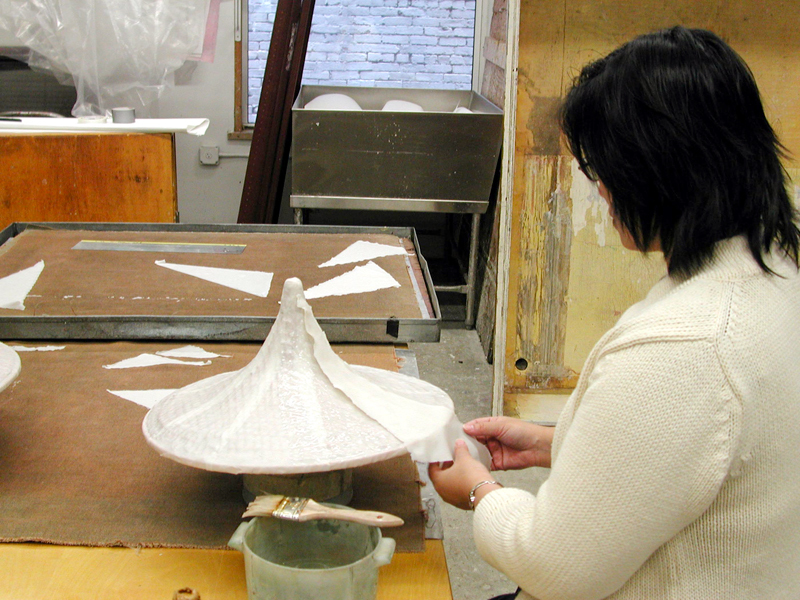 Once dry, the paper forms were removed from the hat. 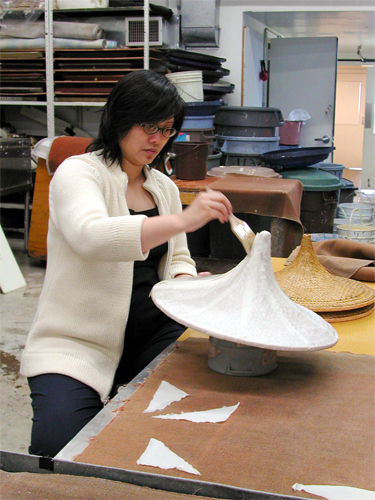 In addition to these works, Huang also worked on a series of two-dimensional works using images of her grandmother and of a “baby Buddha.” For these pieces, Huang used fabric paint to make line drawings on no-see-um mosquito netting which was used as a watermarking device on top of the papermaking mould. 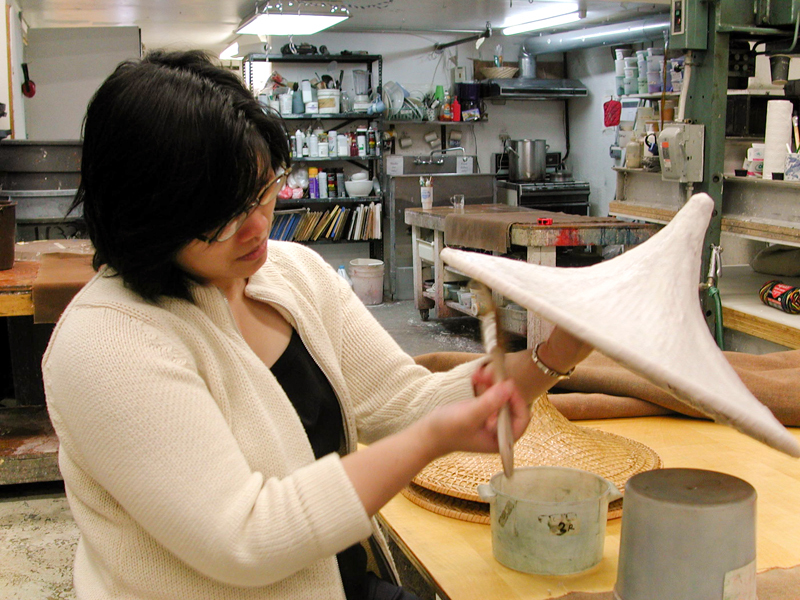 For these works, Huang and studio director Paul Wong worked together to develop a new papermaking technique combining pulp painting and watermarking. The wet no-see-um/fabric paint watermark was placed on the papermaking mould and sprayed down with water. Then, pulp paint was used to fill in different areas of the fabric painted lines. Next, the deckle was put on the mould, holding the no-see-um in place, and the mould and deckle were used to gently pull a sheet of translucent abaca over the pulp painted watermark. Once the sheet was drained, it was couched onto a base sheet of colored pulp. The resulting piece is a clear, line watermark with the colored base sheet showing through and illuminating the lines, with areas of color carefully placed on top. 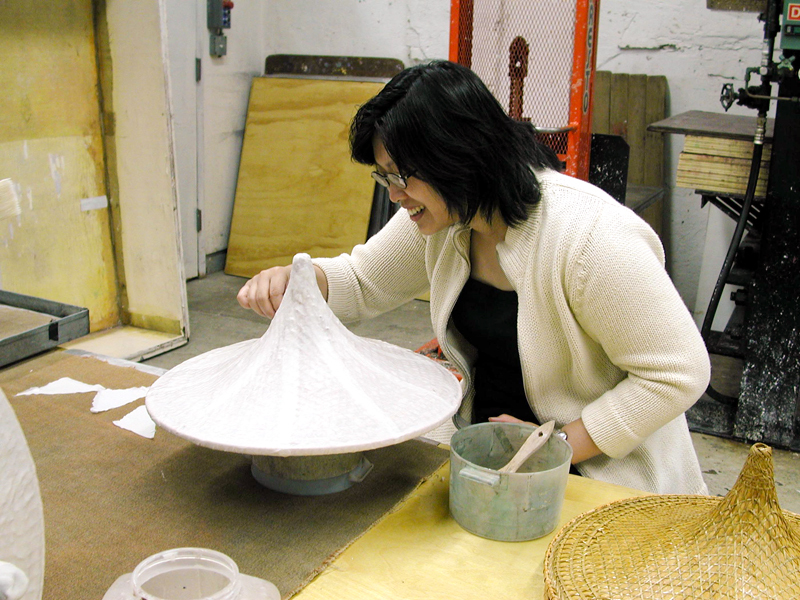 Huang received her BFA in Painting from Pratt Institute in 1994 and her MFA in Printmaking from the University of Michigan in 1996. Huang also teaches drawing at Pratt Institute.